Stores seem to be stocking these tasty pillows of bready goodness earlier and earlier every year, and you know what? I'm ok with that. 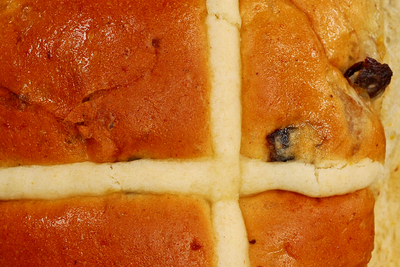 Where's the best place to pick up hot cross buns in Sydney this Easter? Bourke Street bakery used to do oversized hot cross buns, which were insane! Like a whole loaf of hot cross bun! Genius! I've heard good things about Black Star Bakery in Newtown as well but have yet to have the pleasure of experiencing them. But in all honesty, though I know I'm not meant to, I actually kinda like the supermarket ones. They're just so soft and easy to eat, like, an entire bag in one sitting... err, I mean, ration them out like an adult. Yep. Bourke Street Bakery have some great Hot Cross Buns, otherwise I love Bowan Island Bakery at Drummoyne. You can buy Bowan Island Bakery hot cross buns (even chocolate chip ones) at David Jones Food Halls in the city. Imperial Gluten Free Bakery in Rydalmere has been known to make gluten free hot cross buns around Easter time. And you wouldn't know the difference from the regular thing. Yum.